1959 trivia playing cards. 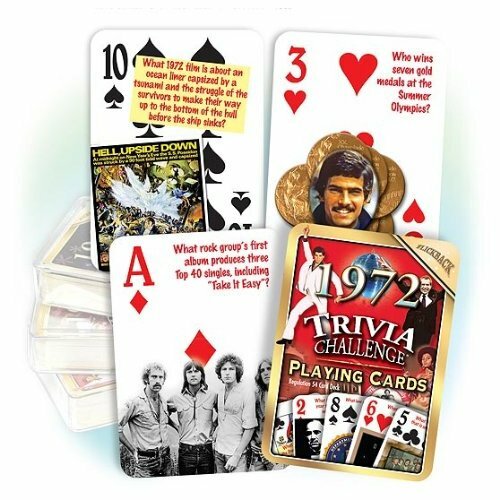 You don't have to search further for a really nice 60th birthday gift or a 60th anniversary gift other than our set of 1959 playing trivia cards. 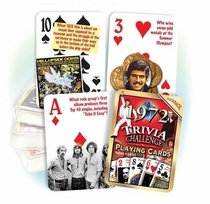 Each of the cards has a 1959 trivia question accompanied by a picture as well. Without a doubt, they add to a memorable card party! Here are some sample 60th anniversary cards: A science fiction novel is Kurt Vonnegut's second published book. What is its title? (The Sirens of Titan), Which Australian born film actor, known for his swashbuckling romantic roles, dies this year? (Errol Flynn), What television show featuring Annette Funicello ends its four year run on ABC? (The Mickey Mouse Club), Known as "The Day the Music Died" what happens during an Iowa snowstorm February 3rd? (Buddy Holly, Richie Valens and the Big Bopper die in a plane crash). What type of battery does Everready Battery engineer Lewis Urry invent? (the long lasting alkaline battery), What TV Show ends this year that featured the opening line: "Ladies and gentlemen, the story you are about to hear is true. Only the names have been changed to protect the innocent."? (Dragnet). See also our other 60th gifts.